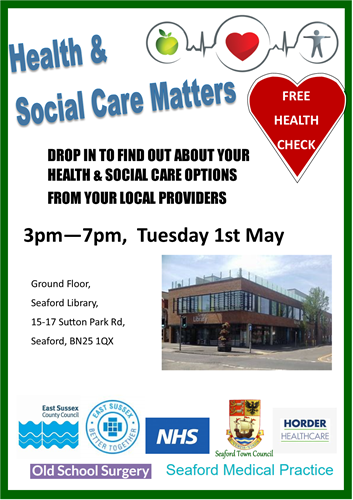 Seaford Town Council is excited to announce the upcoming free Health and Social Care drop-in session at Seaford Library on Tuesday 1st May 2018 from 3-7pm. In the last few years more and more health services are being delivered locally in Seaford, but it is still felt by the providers that some residents may be unaware of the services available. This drop-in session is a great opportunity for residents to pop in and find out about the range of services currently provided locally in Seaford. Staff members from a whole range of health providers will be in attendance, from the Clinical Commissioning Group to the Mental Health and Adult Social Care teams. They will have a wealth of information to share, be giving guided talks on local services and happily answer any questions residents may have. In addition to allowing residents to explore the social care options available, there will be an emphasis on care that can be provided to enable people to remain at home and be treated close to home. This opportunity has been brought about through a working partnership between Seaford Town Council and East Sussex County Council in conjunction with local Doctor’s surgeries, the NHS, carer support services and many others.